Linda Åkeson McGurk, author of "There's No Such Thing as Bad Weather"
Emily: Do you garden with your kids? As a mother, writer, and now author of an important book on the benefits of getting kids in nature, what role do you think gardening can play in a child's life? La: I think gardening is a wonderful way to connect children with nature and help them understand where their food comes from, as well as how they fit into the eco system. We also know that there are beneficial microbes in the soil, which can trigger “happiness hormones” in the brain and improve our mood and even help protect against anxiety and depression. This is huge considering that these mental disorders are on the rise among children. My mom is a big gardener, so growing vegetables was a natural part of my childhood. Unfortunately, I haven’t inherited her green thumb, but I try to grow a few things with my kids in our backyard every year. I don’t strive for perfection; I think the most important thing is to get out there with your kids and get your hands dirty together. I try to choose crops that are easy to grow and don’t stress too much when we have a crop failure. There are a lot of things to learn from those too! Emily: What are your family's favorite outdoor activities in each season? How have these changes over the years? Linda: When my kids were little my main focus was to make sure they had time for unstructured outdoor play every day. During the week, that typically meant getting outside in the backyard and just doing whatever my kids wanted to do – climb a tree, explore the creek, or play in their “mud kitchen.” This type of free play outdoors offers everything a child needs in the early years and even today, at ages 7 and 10, this is what my kids do outside a majority of the time, all year round. On the weekends, when we have more time, we may go for a hike or bike ride, have a picnic at the park or tend to the garden during the warmer months. In the winter, we enjoy sledding, downhill skiing and hiking. How we recreate outdoors actually hasn’t changed that much, but what has changed is the girls’ mobility. From hiking with one baby in a carrier, I now have two children who are both very mobile by foot, ski and bike, which makes things a lot easier. Emily: Sometimes kids drag their feet when asked if they want to play outside. In your book you acknowledge that even your girls, who grew up spending time outdoors from a young age will still protest. What advice would you give to parents and educators who feel discouraged by this? I think the most important thing is to make outdoor play a part of your daily rhythm, so that the kids will come to expect it. I’ve always been pretty firm with my kids that we go outside every day, regardless of the weather, even if it’s just for a little while. I also talk to them a lot about why we do it, and now that they’re older the health aspects are ingrained in them. My advice is to stay positive and not give up - a lot of time the hardest part is just getting out the door. My kids rarely protest anymore, but when they do I can usually convince them by suggesting that we play a game of tag or hide and seek. Kids usually want to be where their parents are, so if we go out with them and show that we’re excited about it, they can usually be won over. Emily: We know that getting outside is easier for some families and communities than it is for others. Where I live in Vermont, it is very easy. For my friends who live in densely populated cities, it is much more difficult. What are your thoughts on how we address these barriers? What are some small steps teachers and parents can take? As parents we can only do so much to ensure that our kids get enough outdoor play every day; it has to be a community effort. Many kids spend the majority of their day with other caregivers – for example at daycare or school – so it’s absolutely crucial to get others on board as well. Bringing about change in schools and other institutions won’t be easy, but there are examples of schools where a single passionate teacher or administrator has made a big difference by creating a school garden, a natural play space or an outdoor classroom, or by advocating for more recess or taking the students to the forest once a week. Use these successful cases as a starting point for your own school and see if and how they can be replicated. Creating these types of opportunities for nature connection at school is even more important in bigger cities, where green spaces can be few and far between. I also think we need to rethink nearby nature, and by that, I mean that we should do a better job of utilizing all the little pockets of wild spaces that can be found in cities as well. Kids don’t need manicured parks to have a good time outside, they just need places where they can run wild. Linda Åkeson McGurk is a journalist and author of the parenting memoir There Is No Such Thing As Bad Weather: A Scandinavian Mom’s Secrets for Raising Healthy, Resilient, and Confident Kids (from Friluftsliv to Hygge). She believes that the best childhood memories are created outside, while jumping in puddles, digging in dirt, catching bugs and climbing trees. McGurk blogs about connecting between children and nature at Rain or Shine Mamma, and hopes to inspire other parents and caregivers to get outside with their children every day, regardless of the weather. Follow her on Facebook, Pinterest, Instagram and Twitter. Fermentation Kit – I love my billions of friends in my gut and I do my best to keep them healthy. I’ve brewed my own kombucha for a few years, but growing my own cabbage inspired me to make sauerkraut and kimchi as well! It’s easy enough to make, but I found it difficult to keep the cabbage underneath the water line while waiting for it to ferment. This kit by Kilner makes it very easy, and I love that I can fit more than two whole heads of cabbage in there at once, rather than having 10 different mason jars sitting around my apartment. Salad Spinner – There’s nothing quite like the taste of fresh greens from your own garden, but they can be difficult to rinse clean and store safely. I found that it took a lot of extra time to wash what I needed each day, and often they were still dirty or just too wet. If I washed them all at once, then they would be too wet to store in the refrigerator. This salad spinner allows me to wash and dry all my greens at once so they are clean and crisp when I’m ready to make a salad or smoothie. And nobody loves salad spinners more than kids! Beth says there’s always a battle in her house over which kid gets the first turn. You can even get a mini version for your kids’ play kitchen, or if you have a small amount of greens to clean. French Press – I’ve been interested in learning more about herbalism for years, and gardening has given me a great outlet to do so! I started to make my own tinctures with the herbs I grew last year and have been using a french press to make the solution. It makes it super quick and easy! I also picked up an herb drying rack, an herb stripper, and herb scissors to make preparing my herbs much easier (and more fun). If any of these items sound like something you’d like to have in your kitchen for your next harvest, I have great news! You can purchase any of these items on Amazon and benefit KidsGardening at no cost to you. From now until March 31st, when you sign up for AmazonSmile, they'll TRIPLE the donation for your first purchase! 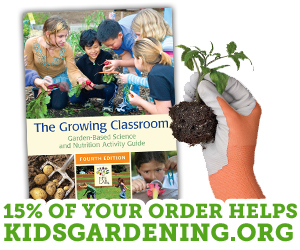 It's an easy way to support garden-based learning. Simply select "KidsGardeningorg Inc" as your designated charity at smile.amazon.com and a percentage of your Amazon order will be donated. What are your favorite kitchen tools to help preserve and enjoy your harvest? Let us know in the comments! Sure, we have a over a foot of snow on the ground here in northern New England, but it’s still seed starting season! (If you’re wondering what seeds to start when or where, check out our resource When to Plant Seeds.) A few weeks ago, we dug out our grow light system, and started the first round of seeds for our community garden plot. (Seed starting for the first time? Read Susan’s blog post to get prepared.) This year, we made it a family activity, and included everyone who wanted to be included, however they wanted to be included. The kids had a lively discussion about who would get to plant which seeds. Luckily we were starting lots of different varieties of eggplant, tomatoes, peppers, herbs, and flowers, so each kid got to pick their favorite packets. We were starting seeds that were packed a few years ago, so we over-planted some of our seeds to ensure germination rates. (Looking for a garden lesson plan on germination? Check out Germination Exploration.) Also, the fine motor skills of 3-year olds lend themselves well to over-planting. Just don’t hesitate to thin your plants! Whether under grow lights, or in the soil of a pot by the window or on the porch, there is nothing quite like the magic of watching a seed sprout. As the growing season approaches I find myself eagerly looking forward to starting seeds in our school greenhouse and eventually planting the garden. And as fun as this process can be, I and maybe other garden educators, classroom teachers and school PTOs need to ask a very important question first: what does our garden budget look like? And so loyal blog readers, today I’m providing five tips to help you think about how you can get your school garden going on a tight budget. Consult your records and adjust accordingly: Each year keep careful track of everything growing in your garden. Did you have a shortage of peppers last summer? Maybe plan on adding 3 or 4 more plants. Was the carrot bed too crowded? Perhaps only go with one pack of seeds this year rather than two. Were there too many cucumbers? Cut back on the number of plants you grow and look for a variety with a smaller yield. Having an accurate estimate of the number of plants you’ll need based on the size of your space and the demand for any given variety will greatly aid the planning process and prevent unwanted expenses on excess materials. Before buying seeds and/or veggie starts reach out to the community: Cooperative Extension offices, community gardening groups, and garden stores might be willing to donate seeds from last year or the year before to your program. There’s absolutely nothing wrong with using older seeds; many times germination rates are just as high as newly packaged seeds! Alternatively, if you don’t have the time or capacity to start your own plants, nurseries might offer up their surplus seedlings if you ask. Use what you have: You might not even need seeds to start your garden, instead try your hand at kitchen scrap gardening and grow celery, various leafy greens, potatoes and even pineapples from leftover food scraps. Get creative with recycling: Rather than buying new growing flats or plastic pots to start seeds, make your own newspaper pots or reuse yogurt containers that students bring in from home, K-cups from the teachers’ lounge, or milk cartons from the cafeteria (check out our Carton to Garden contest if you use cartons to start your garden). You can even make a watering can out of recycled materials by simply poking holes in the screw-on cap of a plastic gallon milk jug. Connect with parents, teachers and other school community members: Interested in adding more supplies to your garden arsenal, look no further than the school community. Ask people to look around their basement and garages for any tools they might want to donate—even old sandbox or beach toys can be effective gardening tools for Pre-K and lower elementary school students. Simple 5 gallon buckets can be perfect for everything from transporting garden debris to container gardening projects. And an old plastic storage container can be the foundation of a worm composting system. You don’t need to have the nicest watering cans, high tech grow lights, or matching trowels and rakes for a garden to have an impact. The simplest garden and tools can still offer meaningful and exciting experiences for youth of all ages.